"Save $300" reflects the total savings received in promotional value when you purchase a Bowflex Revolution® home gym. Offers only valid within the 48 contiguous states of the continental U.S. Offers not available with any other offer and is subject to availability and may change at any time. Offers are valid once to a customer and excludes previously placed orders. Shipping discount applies to standard shipping option only. Offers are not valid at retail stores or outlets. We regret we can not ship to P.O. Box or international destinations. Offers valid for a limited time only. One machine. Over 100 exercises. 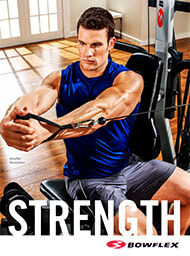 Unlike traditional machines, Bowflex® home gyms utilize advanced resistance technology that doesn't rely on gravity. 18 months promotional financing. That's right, you can pay for your Bowflex® home gym over 18 months on purchases with your Bowflex™ Credit Card! Request free info and discover which Bowflex® home gym is right for you. Build confidence and boost your energy with a Bowflex® home gym.